Chronic pain in the middle of the foot is often the result of a variety of bony abnormalities. The most common of these is flat feet. Painless flat feet are most often a variation of normal and require no treatment. However, if a child with flat feet has foot pain, it requires evaluation. Often no significant abnormality is found and the pain is relieved with the use of an orthotic. Some children have a "rigid" flat foot. This is easy to recognize because it is difficult to move the different parts of the child's foot in relation to each other. 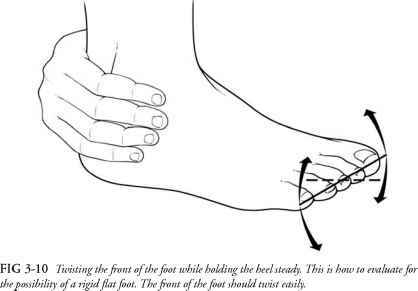 Normally you should be able to simply hold the child's foot in your hand and turn the front part in different directions while holding the heel steady (see Fig. 3-10). In children with a rigid flat foot, it is necessary to determine whether the rigidity is being caused by tarsal coalition (fibrous bands between two or more of the bones in the middle of the foot that restrict motion and thus reduce flexibility) or another abnormality that can be corrected with casting or surgery. Every child with a rigid flat foot should be evaluated by an orthopedist. An accessory tarsal navicular bone is an extra little piece of bone that forms at the base of the navicular bone in the midfoot. The extra bone is easily seen on X-ray. This extra piece of bone sticks out on the inside of the foot and may be painful and tender where it rubs against the inside of the shoe. Many people have these and never realize it. Stretching the shoe or wearing wider shoes often will eliminate the problem. Rare cases may require surgery. Occasionally the extra piece of bone leads to a mistaken diagnosis of a fracture. Kohler's disease is an irregularity of the navicular bone, located in the middle of the foot, behind the metatarsal of the big toe. A typical patient with Kohler's disease is a child under the age of ten who complains of pain when walking and tenderness when the bone is pressed. It can be diagnosed by X-rays or a CAT scan. Kohler's disease usually resolves without treatment, but severe or persistent cases are often treated by casting. Bunions are commonly thought of as a disease of adults. However, they may occur in teenagers, girls more often than boys. With activity these bunions may cause pain. Treatment usually centers on finding properly fitting shoes and other conservative measures. Surgery is generally unnecessary. Pes cavus refers to a condition in which the arch of the foot is unusually high. Children with this uncommon condition often complain of foot pain when running. Usually both feet are affected equally. If only one side is affected, there is often a neurologic problem. Even when both sides are affected, there may be an underlying neuromuscular condition. All children with pes cavus should be carefully examined by an orthopedic specialist. Surgery to correct the deformity may be necessary. Arthritis involving the subtalar joint may occur as a complication of many different forms of childhood arthritis. (The talus is the major bone in the foot where it connects to the leg at the ankle joint. The subtalar joint is located in the middle of the foot, where this bone connects to the bones of the front of the foot.) Because the subtalar joint is responsible for twisting movements of the foot, children with arthritis of the subtalar joint experience pain and difficulty walking on uneven surfaces. Subtalar joint involvement is just one part of a much larger picture in children with arthritis. It may be treated with NSAIDs or local injection. Some children with persistent pain benefit from the use of orthotics that prevent motion in the subtalar joint by holding the foot in a rigid position inside the shoe. Diffuse foot pain is infrequent. One of the most common causes is reflex sympathetic dystrophy, which may begin after an injury to the foot. Children with reflex sympathetic dystrophy often experience color changes in the foot accompanied by profound hypersensitivity. Many of these children cannot put on a shoe or even a sock. This is a complex condition requiring specialized treatment; see Chapter 18.